NEWPORT, RI - As the Newport Gulls Fifth Hall of Fame Ceremony draws near, the Gulls will begin to spotlight all of the seven inductees entering the Hall on February 2, 2019. First up is Jeff Melillo. Jeff Melillo was a catcher for the Newport Gulls in 2011 and 2012 and played his college baseball in his home state of New Jersey at Rutgers University. He took home First Team All- Big East Honors as a junior, was named to the Johnny Bench Award (nation's best catcher) watch list heading into his senior year, and named a Second Team All- Big East performer as a senior. Not only did the 6-foot-2 195-pound backstop excel on the field but off the field he took home four Ron Kish Academic Awards for having the highest Grade Point Average on the Rutgers baseball team. A "tough kid that had a never die attitude" said Newport Gulls Manager Mike Coombs about Melillo. In 2011, Melillo finished the regular season with a .283 batting average, 10 runs, 13 RBI, six doubles, and one home run but most importantly guided his pitching staff to the most wins in the NECBL (29), lowest ERA (2.59), lowest number of walks (125), and second lowest Batting Average Against. The season in which Melillo put together in his second stint in the City by the Sea is arguably the most remarkable in Gulls and New England Collegiate Baseball League history. 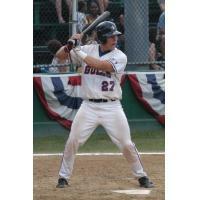 Melillo was the captain of the NECBL Champion and #1 Overall Team in Summer Collegiate Baseball. He was the NECBL Batting Champion (.404), the NECBL Most Improved Player, named to the All- NECBL First Team, an NECBL All-Star, Perfect Game's Top Rising Senior, a Perfect Game Summer Collegiate All- American, and set the NECBL and Newport Gulls record for On Base % (.548)- both records still stand today. The real magic came in the playoffs during the championship game; on a broken foot Jeff hit a home run in Danbury and could barely make it around the bases, legendary. The Newport Gulls are honored to induct Jeff Melillo into the Hall of Fame on February 2, 2019. The Hall of Fame Induction Ceremony is sure to be a special night honoring Melillo and the rest of the inductees. Tickets are available via newportgulls.itemorder.com or by contacting the Newport Gulls Front Office at 401-845-6832 or operations@newportgulls.com .